These are our Medium Thickness Bully Sticks. They are hand-measured and are between 0.5" and 0.75" thick. Our 5-inch Straight Bully Sticks are particularly suitable for small to mid-sized dogs, but are still great for any breed. For aggressive chewers or large dogs, make sure to purchase the thickest size or one of our longer Straight Bully Sticks. All of our Bully Sticks are 100% natural dog chews without any preservatives, chemicals, or additives. On top of that, we take the time to slowly bake each of our Bully Sticks to seal in their natural flavor. They are made from a beef muscle and are low in fat while being high in protein, making them a healthy option for your pooch. As an added bonus, these Bully Sticks help to promote healthy teeth and gums by scraping off tartar, making these some of the greatest bully Sticks for dogs available! We take every precaution possible to ensure that you are receiving a premium dog product. Because of this, we have made the decision to source all of our beef from grass-fed and free-ranging farms for all of our dog treats and dog chews. In our eyes, this is the most socially conscientious method to purchase beef and is a surefire way to ensure high quality and healthy Bully Sticks. NATURAL & HEALTHY: These truly are the best thick bullysticks for dogs and puppies. They are made with NO artificial ingredients, NO hormones, and NO chemicals from free range, grass fed cattle and are rawhide free. 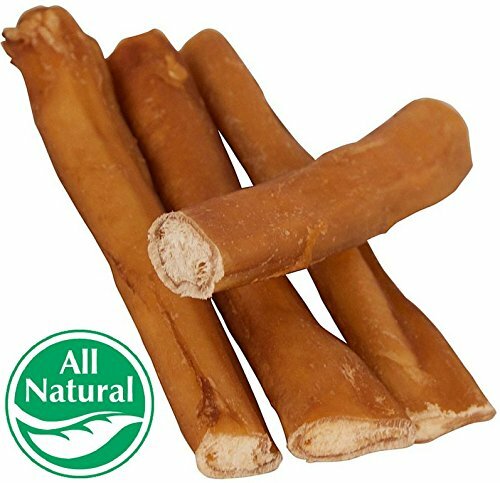 These all-natural beef pizzle dog treats are long-lasting and full-sized. We source the highest quality ingredients ensuring premium low odor monster beef bulley stix that your dog will love. CLEANS DOG TEETH: Dog dental care is important. These natural puppy and dog dental bull sticks help to remove harmful plaque and tartar leading to improvements in overall dental health. Let your dog gnaw on these odorless xl dental treats and watch his teeth sparkle. You'll see that these jumbo chews are truly bark worthy and have little to no smell with lots of flavor. Junior's tail will be wagging in no time! PREMIUM INGREDIENTS & SOURCING: Our supreme bully sticks for dogs and puppies are made in our own South American facilities to ensure the healthiest and safest possible dog chews. Our processing plant adheres to the strictest of quality assurance standards. Additionally, our facilities are up to FDA, USDA, and outside 3rd party USA standards leading to a superior bullystick. BULK WHOLESALE OPTIONS: If you're worried about cost, we've got your back! We offer lots of pack sizes to help you save money. Buy our standard bulky bully sticks and your wallet will thank you. Generally we carry odor free bullies and bulk dog chews in sizes of 10, 25, 50, 100, 250, and up in all lengths-5, 6, 7, 8, 9, and 12 inch. Perfect for anyone looking to stock up on extra giant bullsticks. SATISFACTION GUARANTEE: At Pawstruck, we want you to be 100% satisfied with your purchase of bullie sticks for dogs. That's why we stand behind our 30 day guarantee! If these aren't the best and most natural bull sticks you've ever purchased, our customer care team is ready to help. With a huge variety of unscented Beef & Buffalo bully stick shapes like braids, rings, springs, etc. we're confident we'll find something to suite your needs. If you have any questions about this product by Pawstruck, contact us by completing and submitting the form below. If you are looking for a specif part number, please include it with your message.